Studying the photo you can see that the woven part has been removed from the front beam since it got so wide. I have it wrapped around an empty Christmas paper tube between a couple of rulers to keep it straight. When I am weaving, I put a metal pole in the tube to get a nice tension. Seems to work quite well. 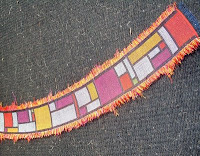 Our challenge this year for the Southern California Handweavers Guild was to have a conversation in fiber with either Piet Mondrian or Georgia O'Keeffe and use at least one of the Color Connects conference colors. All the Conversations will be exhibited at the Weaving and Fiber Festival on November 2 at the Torrance Cultural Center in Torrance California. I created a hat. 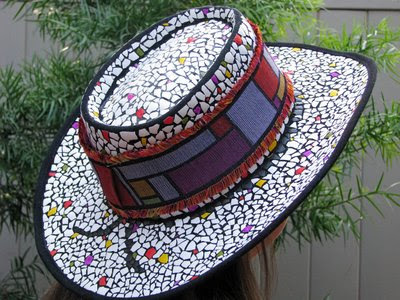 It is a 'Little Joe' cowboy hat covered in a mosaic of egg shells with a Mondrian inspired hat band. These were the inspiration for the colors of my Mondrian Over Easy hat that I recently finished and will unveil to the group on Saturday. 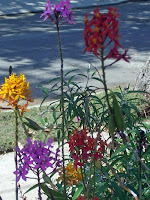 These are flowers from a garden down the street - we walk the dogs by these flowers almost everyday. They match nicely with the conference colors. The band was straight when I wove it but during wet finishing I nudged it into a curve so the band would fit better on the hat. Using egg shells as a surface design takes a bit of finesse, patience and steady hands. But the result is well worth the effort. I love the hat. Can't wait for the Exhibit to be over so I can wear it. If you are in Southern California on Sunday November 2 stop by and check it out in person at the Weaving & Fiber Festival taking place in the Torrance Cultural Center from 10pm to 4pm. Piet: I construct lines and color combinations on a flat surface, in order to express general beauty with the utmost awareness. Nicki: I use egg shells to make my lines emerge and metallic thread to make my colors pop but since the earth is round I prefer my curves to your flat surfaces. Piet: Oh, curves are so emotional. Nicki: But emotion ignites inspiration. Piet: Nature inspires me… but I want to come as close as possible to the truth and abstract everything from that, until I reach the foundation of things. Nicki: I understand. But does that not beg the question- which came first, the chicken or the egg? The results of yesterday's dye day. The colors came out great...a lovely set of saturated colors all in my tapestry yarn of choice. 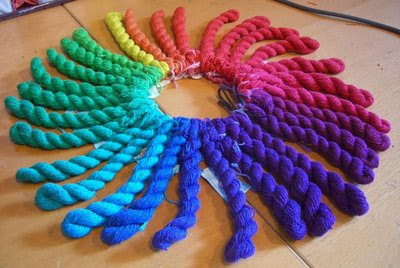 I've taken a number of dye classes but I think using your own yarn, the yarn you use day in day out, is the way to go.